A Canadian Veterans World Champion? For a third year running the IRF Racketlon World Tour made its only North American stop in Toronto over the last week-end. This year's big surprise was the Elite runner-up Danny Shannon, a 47-year-old possible contender for the Veterans' World Champion title in the beginning of June, who travelled the 2700 km (1700 miles) from Calgary to take part in his first racketlon tournament. He caused two major set-ups (Pintea, Cadieux) on his way to the final but, in the end, he could not challenge big favourite and recent World Championship bronze medalist Richard Thomson, who - generally in the tournament - showed off his newly acquired table tennis skills by winning two out of three sets in this, his major weakness(!) of the four disciplines. 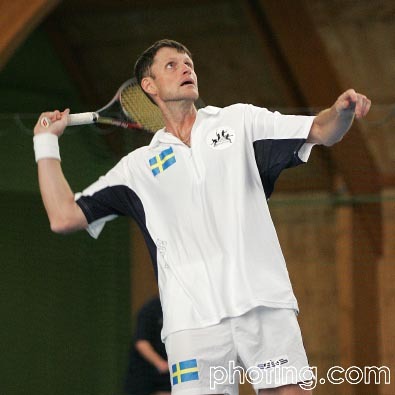 Pär Carleke (the Swedish 2003 + 2004 Veterans World Champion, who never lost a veteran racketlon match), confirmed to Racketlon.com earlier today that he is planning to take part at the World Championships in Belgium. He should be warned that there might be an elite(!) tour event runner-up in the Veterans Class! Mighty veteran Pär Carleke, Sweden. B&R member and racketlon newcomer Martha McKay beat out last years runner-up Sabrina Ng 6-21, 10-21, 21-6, 21-6 (+4). The final featured Alex Bruce, a B&R badminton junior who is ranked #3 (U16) in the country and former national champion and top 50 singles player in tennis, Sonya Jayeseelan. The table tennis was a close battle with Bruce coming out on top 21-20. Bruce, the badminton prodige, wasted no time displaying her talent and won cruising to a 21-1 victory in badminton. Jayeseelan displayed her competitive spirit by seeking her revenge in squash by winning 21-3 but it was all but over at this point going into tennis, where Sonya was somewhat generous by surrendering 6 points. The final score was +12 for Sonya Jayeseelan. Jennifer Powles won third place over B&R member and home crowd favorite Sue Fleming; 14-21, 9-21, 21-3, 21-12 (+8). In the final York University student Jamie Herman defeated last year competitor Peter Healy; 21-8, 21-11, 18-21, 16-21 (+15). The bronze match between Michael Mclachlan and Paul Poirier became somewhat controversial, but only after the match was completed. The scores had been miscalculated and the one point victory in Michael Mclachlans favor was in fact a tie. With Poirier already showered up, they agreed to a coin toss to decide the winner. Mclachlan won it and took home the third. The scores were 20-21, 7-21, 21-12, 21-15 (even). Ken Berger defeated former amateur champion Albert Wong; 21-10, 2-21, 21-3, 21-12 (+19). The third place went to the Belgium descendent Alain Vandergheynst over newcomer Daryl Des Barres , who swore he would return next year with a group of friends. The scores were 21-14, 21-18, 2-21, 21-5 (+7). Michael Appleton proved to last years O45 champion Gary Helmkay why he is one of the best in the world. He won the table tennis comfortably 21-9 and did well to lose the badminton by only one point to the World O45 badminton champion. The squash was another tight match, with Helmkay barely winning 21-18. 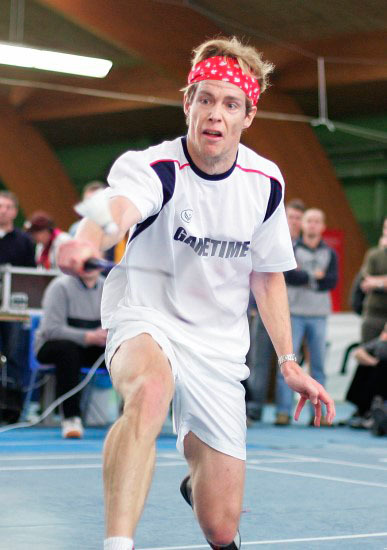 Helmkay, a consitent tennis player was no match for Englands best O45 tennis player. Appleton won the tennis 21-7 for a total margin victory of +22. The bronze match consisted of former top ten provincial badminton player Bill Yeates and Roger Hale, a current resident of California who felt an obligation to come visit us for the tournament. Hale took the table tennis 21-11, while Yeates dominated the badminton 21-1. Hale controlled the squash at 21-6, with the tennis going to Yates 21-11. The overall margin of victory was quite close at +5 for Yeates. With no Europeans in the draw, could anyone challenge Thomson! Danny Shannon, a 47 year old from Calgary shook things up in the early rounds by defeating Horatio Pintea. Horatio is a former table tennis national champion with a world ranking of 80. Shannon proceeded to the finals by beating B&R badminton professional and tournament director Stephane Cadieux in the semi-finals. With Thomson cruising into the final on his side of the draw, the question was; could this newcomer challenge the worlds third best player? Shannon tweaked a calf muscle in his semi-final match against Cadieux and was not sharp enough to challenge Thomson. Thomson won the table tennis and badminton 21-9, leaving the former top 10 provincially ranked Shannon in a very difficult spot. The squash proved to be a very good display of shot making, with Thomson winning 21-18. The match at this point was over with a spread of +27. The bronze match featured Stephane Cadieux against newcomer Rod Bedard, a former national competitor in table tennis. Rod Bedard was a dominating force in table tennis with a 21-2 victory. Cadieux had opportunities to seek redemption with the badminton victory of 21-3 and squash 21-7. The tennis went in Cadieuxs favor 21-14 giving him the match with a total difference of +20. Overall, I would consider the tournament to be a great success. The competitors played hard, played fair, and we all had a few laughs. The atmosphere and energy in the club was amazing throughout the entire week-end. We look forward to next years Canadian Racketlon.